The other day I paid a visit to the Solent Sky Museum in Southampton. The museum originally opened as the Southampton Hall of Aviation in the 1980s, I remember visiting as a child in the early 1990s and am ashamed not to have returned until now. 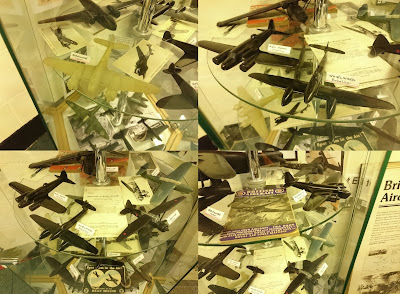 It is a fascinating place packed full of planes of all shapes and sizes, there is almost too much to see. With so much to take in it is a little overwhelming to start but once you get your eye in it becomes easier to focus on the individual planes and even the details and amazing points of interest. A view of some of the aircraft on display at Solent Sky. I hadn’t planned to do any plastics spotting as I entered the museum. I like planes, but I don’t know a great deal about them and I certainly couldn’t tell one from another without some substancial research before hand. I am however, interested in design and engineering and can appreciate the work that has gone into the development of these gravity defying machines. The first objects that piqued my plastics spotting interest where some of the smallest objects on display and housed in a small room off the main hall. The room is dedicated to the story of Southampton during the Second World War. Southampton, being a dock and home of the Spitfire was heavily bombed. It was important that people on the home front could recognise the difference between ally planes and those of the enemy; which were a threat and which weren’t. 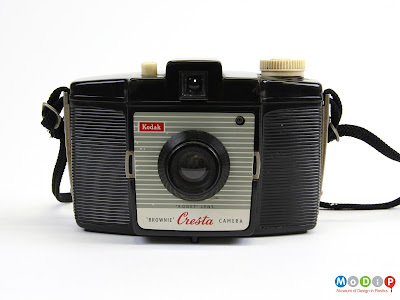 The objects that really caught my eye were designed to help both pilots and the ground based Observer Corps to identify aircraft. 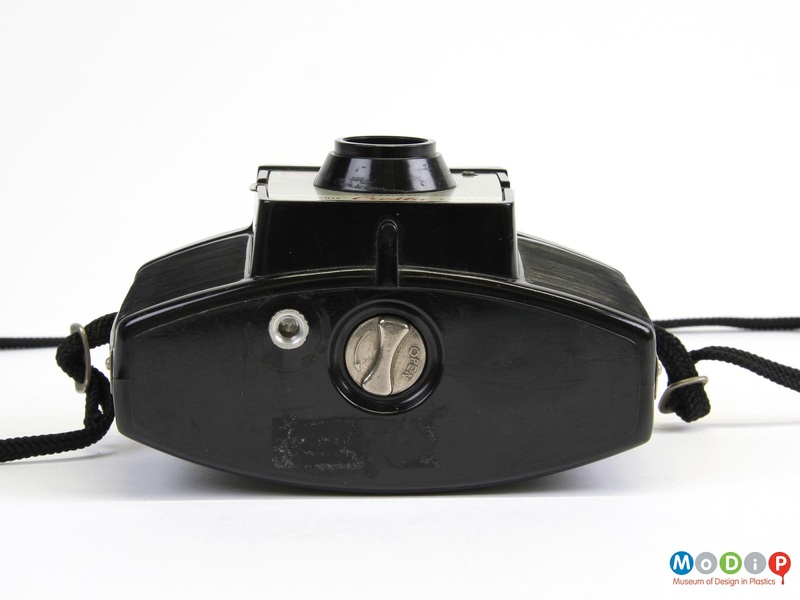 These models, known as recognition models, were made of wood, metal, and later phenol formaldehyde and nylon. The idea is that from a distance the most identifible part of a plane is its silhouette, its shape. The models can be held at any angle and be viewed from any direction. One of the most iconic planes from the Second World War must be the Spitfire, and it has significant links to Southampton being built in the area. Of course the Spitfire also has a significant plastics link too. The curved canopy that can be seen in the image below is made of arcylic and MoDiP would love an example for our collection. The Spitfire was not the only aircraft to have acrylic ‘windows'. 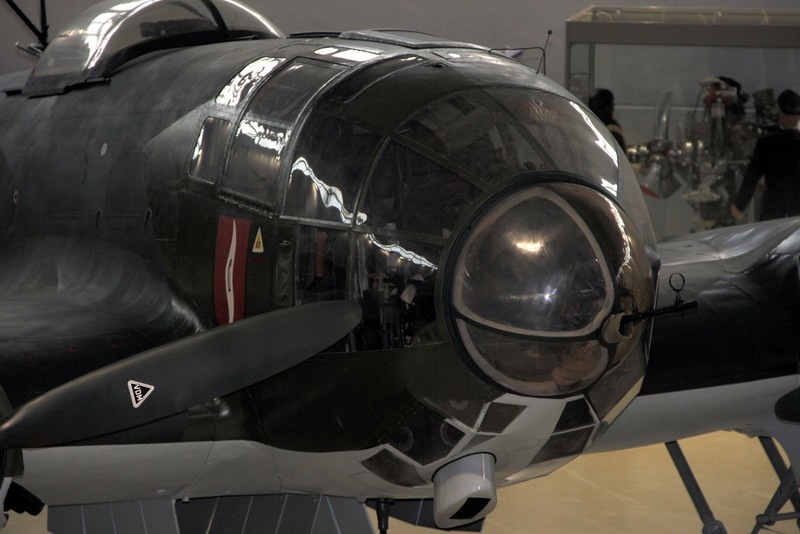 The wartime German Heinkel series of planes had an acrylic nose through which a machine gun would be mounted. The gun operator would have had a fantastic view but they would have had to be very brave to be sat in that position. The nose of this Heinkel had been recovered from the sea. There are some significant stress marks showing on the far side. Machine gun was mounted on Ikaria ball-and-socket. Type of gun mounted wa 7.92mm MG 15 machine gun. The aircraft on display at Solent Sky are not all related to the military and range from a variety of dates. The largest plane on display is the Beachcomber Flying boat, the hall was built specially to house it. Visitors are able to get inside the vehicle and see the see the luxury and space afforded this giant machine. A bar, removed from the last Aquila flying boat, topped with wipe-clean Formica. 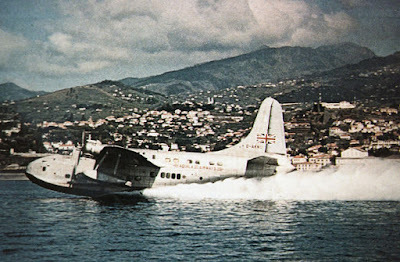 Find out more about commercial flying boats on the Solent Sky website. The simplest form of aircraft has to be the hang glider consisting of a large polyester sail designed to catch the lifting air currents. Hang glider on display at Solent Sky. Mounted high up in the ceiling is the most intriguing plane, it has a small body with a relatively large wingspan and would have originally been covered in a silver coloured nylon skin. The plane is the 1961 SUMPAC, Southampton University Man Powered Aircraft, which became the first British designed plane to fly powered by a person. SUMPAC, Southampton University Man Powered Aircraft. Solent Sky really is a must see museum staffed by knowledgeable, enthusiastic staff. There is so much to see, it doesn’t matter how much or little you know about planes, you can’t help but be charmed by the place. 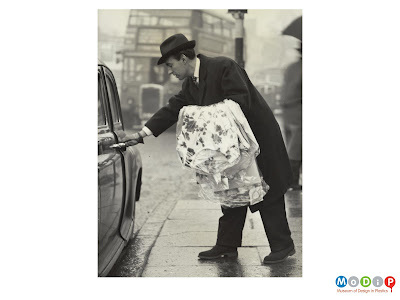 This week’s image shows a man holding garment bags. In this exhibition, MoDiP puts the spotlight on the work of designers and familiar companies whose use of plastic has been significant in the products we showcase. Shunning the ‘poor relation’ attitude to plastic, seemingly no expense has been spared in the production of high quality, well designed products with plastics playing the starring role. MoDiPs latest acquisitions - plastic products made from recycled chewing gum. Currently on display in the AUB library. An article featured in the March 2016 edition of the British Plastics and Rubber magazine caught my attention. It reported the inspiring story of how Anna Bullus has created a mouldable polymer from recycled chewing gum, a challenge she initially set for herself as part of her final year degree project at the University of Brighton. The idea was to manufacture a bin which would collect chewing gum and subsequently be recycled (with contents) to make new bins in a closed-loop recycling solution. After graduating, Anna spent several years in the lab further experimenting and developing the compound she has now called Gum-tec®, and set up her company Gumdrop Ltd in 2009 to manufacture products from this material. Gumdrop Ltd is the first company in the world to recycle and process chewing gum and MoDiP has just acquired their leading product – the Gumdrop. 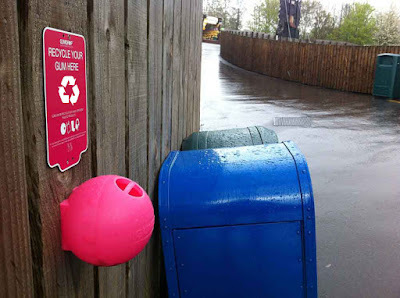 This bright pink, bubble shaped bin has won numerous awards including the British Council's National Design Award in 2007, and since its launch in 2010 has been installed at private companies (Legoland, BAA, Royal Mail), shopping centres, and various towns and cities across the UK. The bins are just being launched in Denmark and are proving to be a great success, currently reducing gum litter by up to 46% in the first 12 weeks of use. 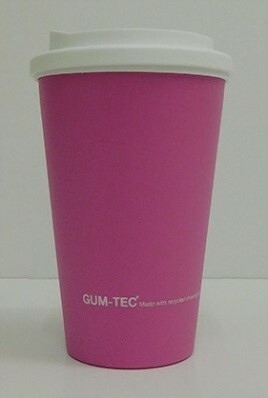 MoDiP has also acquired some other products made using the Gum-tec® material. They are all bright pink in colour and include promotional items such as a yo-yo, a whistle, ruler and pencils, as well as an Americano mug with an insulated wall to keep your coffee hot. I can’t wait for the production of the wellington boots – gumboots made from recycled gum: ingenious! If you would like to find out more about this multi-award winning concept, visit www.gumdropltd.com and don’t forget that you can view these and many other objects made from sustainable resources at MoDiP.